The 6.5 Creedmoor is still, relatively speaking, a baby. It was only a little more than a decade ago that Hornady introduced the cartridge to the world. Aimed at long-range target shooters initially, it’s since found its way into the hunting realm, too. But compared to, say, the venerable.30-06, it remains an unknown for many. I try to do a lot of my outdoors shopping in small mom and pop-type stores. But in a Walmart a few months ago, I swung by the ammo counter to get a few boxes. It was all encased in glass behind the counter, low enough to the floor that the young clerk had to kneel down to get any out. As she was retrieving a brick of .22 rimfire rounds for me, I asked if she had any 6.5 Creedmoors. 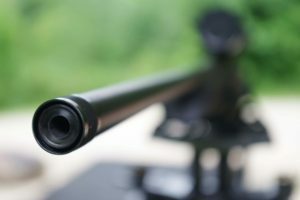 The 6.5 Creedmoor is an accurate round. She gave me a long, uncomprehending stare that suggested bad news was coming. They didn’t have any then. Not in that Walmart, nor in one or two others I checked out of curiosity. Recently, I noticed 6.5 Creedmoor ammo – and not just one kind, but three brands in various weights, with lead and polymer tips – in several Walmarts. There isn’t a ton of it. Especially not in comparison to the many boxes of 30-30s, 270s, .30-06s and even .308s. But it’s there. So, 6.5 Creedmoor, welcome to the masses. I expect the round will continue to grow in popularity. It’s fast, flat shooting and, maybe most importantly, effective at taking white-tailed deer, the nation’s most popular big game species. 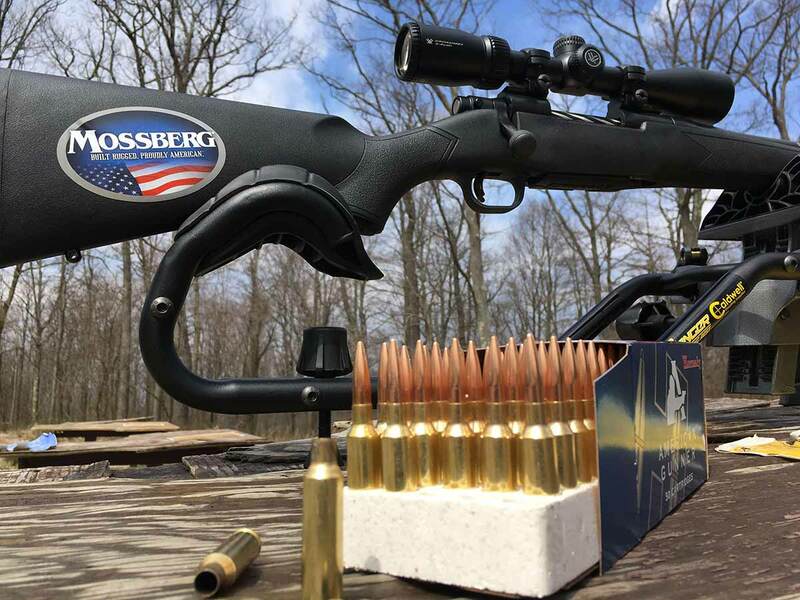 With that in mind, I tested three 6.5 Creedmoor bolt action rifles new, or relatively so, to the market. They were the Winchester XPR Sport, Mossberg Patriot and Thompson Center Compass. All promised minute of angle accuracy, meaning they should fire 1-inch groups at 100 yards, or even better. In the end, each delivered. Three shots, with all of the holes touching, able to be covered by a dime, that’s how good things got when I was on my game. So yeah, I’m officially a fan of this round. But let’s talk specifics. Here’s a look at each rifle. The Winchester XPR Sporter in 6.5 Creedmoor. Winchester has been around a long time, of course. And so some of its rifles – time-tested as they are, such as the Model 70 – cost a lot of money up front. Reputation has a price, after all. Winchester’s XPR line of bolt-action rifles is meant to be a budget-friendly alternative. You still get the Winchester name, but, — with a manufacturer’s suggested retail price of $599.99 – you only pay half or a third as much as you might otherwise. But looks still count for something, right? And the Sporter, the 2018 addition to the XPR line, is a beauty right out of the box. It’s got a Grade 1 walnut stock with a satin finish, with checkering on the grip and fore-end. That compliments the matte blueing on the barrel and receiver. It’s a refined, traditional look with a lot of appeal. Checkering on the Winchester XPR Sporter in 6.5 Creedmoor. Of course, a rifle’s got to perform to have any real value. The XPR Sporter delivers there, too. For testing – given that this is a moderately-priced rifle – I topped it with a similarly middle-of the-road scope, a Nikon long-range hunting reticle 3-9X40. I then fired several varieties of Hornady ammunition – 140-grain boat tail hollow points and 129-grain soft points, primarily — through it (using the same ammo for the following two rifles, too). This rifle provided exceedingly accurate. 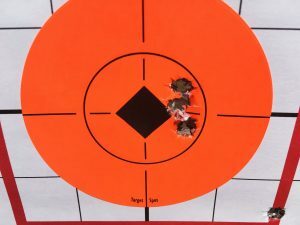 At 100 yards I was able to consistently group three shots in about 0.75 inches, sometimes with the aforementioned three holes all touching. Even at 200 yards, groups much smaller than 2 inches – usually closer to 1.25 — were the norm. Operation of the rifle feels natural in the hand, as well. The right-handed tang safety is easy to reach and operate with a thumb while gripping the rifle. What’s really nice, though, is the bold release button located just in front of it. Push the button and you can operate the bolt, to unload the rifle, for instance, without having to take it off safe. That’s a real winner. The bolt meanwhile, is crisp, operating with a 60-degree angle so there’s plenty of clearance around a scope. The detachable, 4-round magazine clips in and out reliably, though, like so many on the market today, is all plastic. Then there’s the recoil pad. No 6.5 Creedmoor kicks especially hard. But the ample pad on the XPR is meant to deaden it using what Winchester terms “inflex technology.” It’s supposed to direct the energy on recoil down and away from your face. The “inflex technology” recoil pad on the Winchester XPR in 6.5 Creedmoor. I’m not sure what inflex technology is, but I can say it seems to work. I noticed recoil less with this rifle than any of the others. The XPR Sporter has some other, higher-quality features meant to aid accuracy. It’s got an adjustable trigger – with the test gun I fired having little in the way of trigger creep – and a 22-inch, free floating barrel. That barrel has a recessed crown, too. That means the rifling stops just short of the end. That’s to keep it from getting scratched or dinged while in the field, something that can negatively impact accuracy. Add it all up and this is a very fine rifle, especially for the price. It’s the most expensive of the three here, but not outrageously so. Get one and you can expect to use it for a long while to good effect in the woods, then pass it along to the next generation. 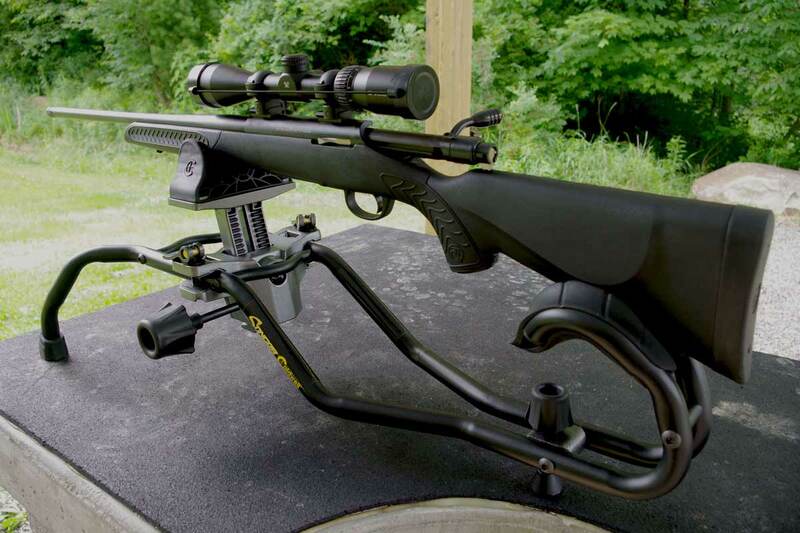 The Mossberg Patriot Vortex Scoped Combo in 6.5 Creedmoor. Mossbergs are, in my experience, solid, reliable firearms. Study. Dependable. Affordable. They are also, though, sometimes … well, plain. Maybe utilitarian is a better way to put it. They get the job done, but they don’t always necessarily wow you sitting in the gun cabinet. The Patriot attempts to break from that mold a bit. It has a 22-inch, free-floating barrel, like the Winchester with a recessed crown. Mossberg, though, added fluting to the barrel. 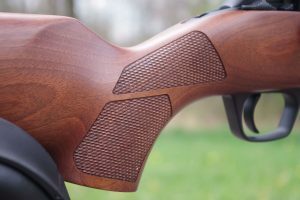 Lateral grooves run the length of it, or at least from the fore-end to the muzzle. Flulting on the barrel of the Mossberg Patriot in 6.5 Creedmoor. The bolt likewise has spiral grooves, reminiscent of the twisting in a soft-serve ice cream cone. The stock, at least on the black synthetic model I tested, has some texture to it. It’s not checkering, just more of a pebbly feel intended to provide grip as well as be aesthetically pleasing. Those little touches don’t make the Patriot Weatherby-like in looks, but they are nice nonetheless. They at least make the Patriot stand out a bit from the lot of generic-looking black synthetic stocked rifles out there. (And there is a version with a walnut stock, too, if you want to get really dressy). From there, the rifle performed like you’d expect a Mossberg to, which is to say well. The model I tested was a Patriot Vortex Scoped Combo. It comes with a Crossfire II 3-9X40 scope with a “dead hold” reticle, meant to allow shooters to compensate for holdover and windage. 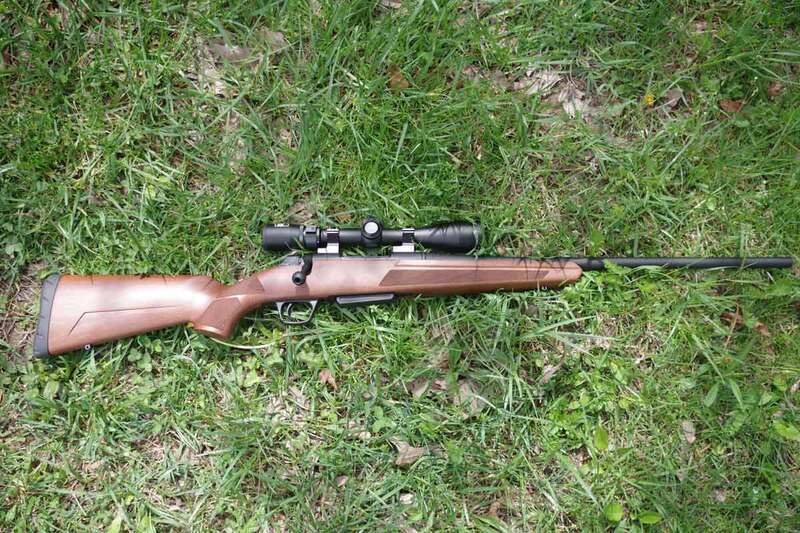 The whole setup, rifle and all, has a suggested price of about $540, so the scope isn’t necessarily a high-end optic. But paired with this rifle, it’s a nice fit. In fact, that’s what I really liked about this rifle-scope combo. Right out of the box, it’s a fine hunting tool, which is ultimately what it’s meant to be. The decorative bolt onthe 6.5 Creedmoor Mossberg Patriot. Mine performed that way. I didn’t adjust the trigger; it broke well, without being too touchy, as is from the factory. My best groups at 100 yards at the range were around the 1-inch mark. At twice the distance, the groups were still less than twice that size. The recoil pad on this rifle is fairly substantial, too, so that helps. You can put a lot of rounds through it without feeling punchy. The bolt felt a little loose to me, with a bit too much play in it. But that didn’t affect performance. There were no issues feeding rounds or ejecting them. The tang safety on the right side, meanwhile, is easy to reach, if a bit stiff. There were no problems working it on the range. But on a cold December days in deer season, when you have gloves on chilled hands, you’d have to give it a fair push, which isn’t a bad thing I suppose. The Patriot comes with a 5-round detachable magazine, again plastic. It was functional, and sturdy enough. If we’re being picky, a metal magazine would be nice. But that’s one place all manufacturers get thrifty to keep prices down, it seems, so it is what it is. My grandfather would have liked this gun. A practical man, he’d have enjoyed its looks and admired even more its reliability and price. He’d have kept it in a corner, pulled it out when needed, used it as designed, then cleaned it and put it back, like he did all his tools. A rifle that can handle that is more than OK, and the Patriot measures up. The Thompson Center Compass in 6.5 Creedmoor. But I was intrigued from the get go. I first encountered the Thompson Center Compass at the Great American Outdoor Show in Harrisburg, Pa. In some ways, it looks like so many of the other black bolt actions on the market. But then I noticed the end of the barrel. It comes from the factory threaded and ready for a suppressor. A suppressor isn’t a necessity. You can shoot the rifle without it. But you can also unscrew the end cap – something that’s easy to do by hand — and put one on if you want. That’s a selling point to me. Since going on a fox hunt last winter, after dark, with a suppressed .17 HMR, and hearing just how quiet things can be, I’m a fan of silence. 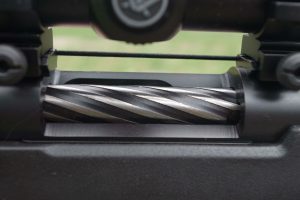 The Thompson Center Compass in 6.5 Creedmoor comes suppressor ready. So at the show I picked up the Compass and pointed it toward the roof far above, sighting along the barrel. How much, I asked the factory representative? When he told me the Compass typically sells for $399, I decided I had to try one. I’m glad I did. This is a lot of gun for the money, one perfect for veteran shooters, but maybe especially for someone getting into hunting and looking to buy a rifle that’s reliable yet affordable. I tested mine using the same Vortex scope that was on the Mossberg Patriot. Like the other 6.5 Creedmoors, this one was said to be capable of shooting sub-1-inch groups at 100 yards. It came very close, on average. Maybe it was me, but I had a little trouble being as consistent with the Compass as the other rifles. But it still performed well. Most of my groups were right around 1 inch at 100 yards, and even the worst were only about 1.3 inches. It, too, has a 22-inch, free floating barrel. Unique to this rifle, though, are its grooves. 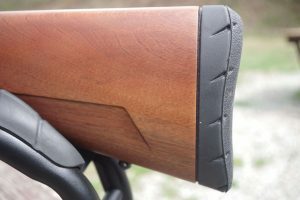 In many rifles, the grooves in the barrel are sharp. The Compass, though, has what Thompson Center calls 5R rifling. 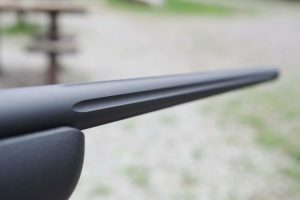 It has softer edges, something the company says leads to less bullet deformation, less fouling in the grooves and, ultimately, better accuracy over longer time. The safety on the 6.5 Creedmoor Thompson Center Compass is built into the bolt. I didn’t have the rifle long enough to determine that, but it was easy to clean, another supposed benefit of the 5R rifling. The Compass also comes with an adjustable trigger, black synthetic stock, with ridges on the grip and fore-end to provide good hold, and a 5-round detachable magazine that fits flush with the stock. Two things about the bolt are noteworthy. First, the bolt head is oblong shaped – like your thumb from the first knuckle to the tip – rather than round. That wasn’t a problem, just different. One other thing did take some getting used to. 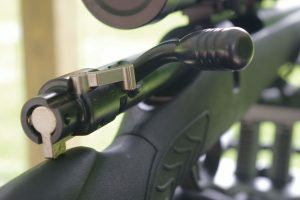 That’s the rifle’s safety, which is located on the bolt. It’s a three-position affair. Move the safety all the way one direction and you can fire and work the bolt. Move it all the way the other direction and it locks, leaving the trigger and bolt both inoperable. Put it in the center position and you can work the bolt, to load and unload, but not fire. That was a little awkward at first, but with time it would become second nature, I’d think. Then, it would be time to go hunting. This rifle is one made for that, and well worth the money. So, three 6.5 Creedmoors, all promising exceptional accuracy, and all delivering. I walked away from the range liking each one – and feeling pretty good about my shooting, too. Now, we’ll see how deer season goes.